His words evince both an interest in the market and a lack of knowledge about its gyrations. There is at least one thing he is right about: The stock market is indeed in a slump. For the past few days, indices from around the world have been in various states of free fall, correction, surge, and panic, with the Dow Jones Industrial Average experiencing its biggest-ever one-day point drop on Monday, Nasdaq halting trades in a few financial instruments linked to market volatility, and apocalyptic headlines piling up. Animal spirits, in the memorable phrasing of the economist John Maynard Keynes, are loose. Trump is right about another thing too: The U.S. does have so much good (great) news about the economy at the moment. Every developed economy on earth is growing right now, for the first time in a decade. Corporate earnings are coming in higher than expected this season, and the jobs market is potentially close to full employment. The major leading indicators continue to look good, as well, dampening fears of an imminent correction or recession. But his tweet evinces both a prurient interest in the market and a lack of knowledge about its gyrations. The stock market is not a reflection of the true state of the economy. It does not always go up as the economy strengthens, or decline as the economy falls. And no one, save for some day traders and investors with a very short time horizon, need to spend much time worrying what it is doing or why—at least not for now. In Trump’s formulation, financial markets have a simplistic, monocausal relationship with economic data: good news, markets up; bad news, markets down. In reality, though, financial markets have an obtuse, metaphysical relationship with economic data: good news, who knows; bad news, who knows. 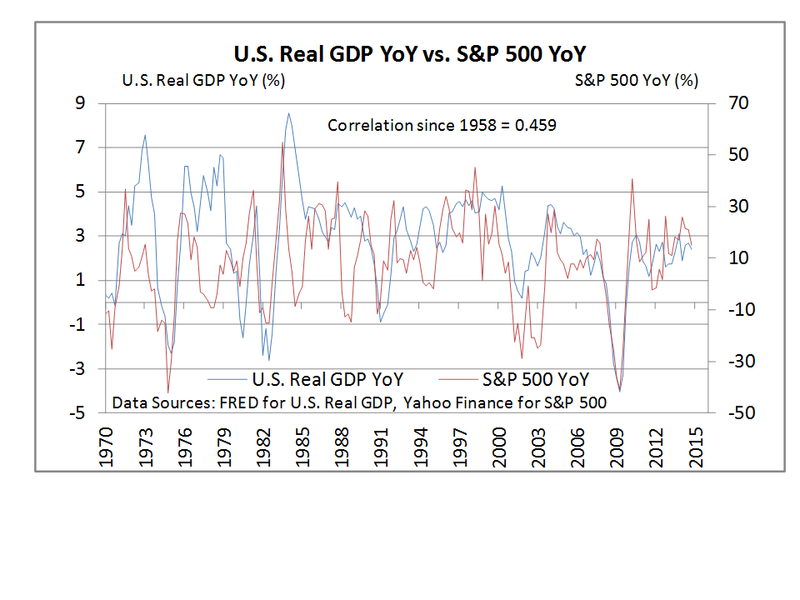 As a very general point, the markets do tend to drift in the same direction as the economy. Recessions tend to come with declines in the Standard & Poor’s 500 (a far better index to keep an eye on than the Dow Jones, by the way). Expansions tend to come with bull markets. But the financial markets tend to be vastly more volatile than headline economic figures—and that is true even in the long period of unusually low volatility that appeared to end late last week. An economy growing 2 percent a year might see market surges of 2 percent a day, or swift year-on-year growth of 10 percent. Plus, on a day-to-day level, good economic news does not cleanly translate into a higher market, nor does bad news translate into a worse one. Financial traders take in a huge number of economic and financial variables. They bet on what the other guy knows. They signal. They hedge. They construct algorithms to seek out strange correlations. As such, in the short term, it tends to be surprising news—not good or bad news—that forces market movements. And sometimes it is no news at all. Indeed, it is often totally unclear what causes a given surge or sell-off. Trump was trumpeting the theory that better-than-expected jobs and wage numbers raised concerns about rising inflation and tighter monetary policy. “The U.S. Federal Reserve is raising interest rates to prevent the economy from overheating,” Ken Griffin, the founder of the investment behemoth Citadel, wrote in a note late last week, just as the market started to sour. “We are particularly concerned about the nascent signs of accelerating inflation in many countries around the world, given the general complacency around the risks of an inflationary shock.” But nobody knows for sure. Perhaps the gyrations have to do with interest rates. Perhaps they have to do with rising wages cutting into corporate profits. Perhaps they have to do with algorithmic trading. Perhaps traders are trolling the new Federal Reserve chairman. The important thing—and the reason it seems that most Americans can safely ignore the turbulence—is that the economic and business outlook remains rosy. Global growth is secure for now; the Federal Reserve has telegraphed its intention to increase interest rates; businesses are competing for workers. “It seems like people are pricing in that the tax cut is going to have more of a near-term stimulative effect then maybe we appreciated a few months ago,” Neel Kashkari, the president of the Federal Reserve Bank of Minneapolis, said in a television interview this week. Further, it would take a much more significant sell-off to mar the extraordinary bull run that has gone on for nearly a decade at this point. After the setbacks of the past few days, the Dow Jones is back where it was in December—which is still far higher than it was when President Trump took office, let alone when President Barack Obama took office. Anyone with an investment horizon longer than a few weeks is likely to be firmly in the black, and anyone with an investment horizon longer than a few days would probably do well to ignore the headlines and flashing lights. That goes for President Trump, too. Presidents have historically tried to avoid talking about these volatile investments, given that what goes up so often goes down, and given that what is good for traders and investors is not always good for workers. But this president touted that the market has “smashed one record after another, gaining $8 trillion in value” in his State of the Union address, and argued that “the reason our stock market is so successful is because of me” a few months ago. That, to be clear, is not true either.